Ade's first instrument was the piano, which he began learning at 12 and kept on to grade 5. He joined a punk group "UXB" in 1978 and learnt to play drums on the job. In 1982, Ade played in a band called "The Inkblots" - his was the last member to leave the band back in 1987. 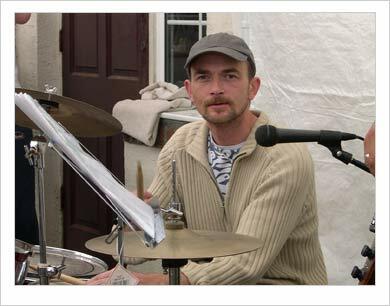 He has gleaned quite a lot of live playing experience over the years from his first flailings with "UXB" including the Acton Anual Police Ball, playing their great hit "Big Blue Car", to several gigs with the truly fantastic HTFib. Ade is qualified to drive anything!